Planning is important. I momentarily realized this while I was working a summer job in between grades 11 and 12 at a local restaurant. I was assigned to clean tables that afternoon. For whatever reason there was a lot of left-overs that day - all of which went into the garbage. The wheeled cart which held the garbage (along with dirty napkins and dinnerware) was located in a recess on wall of the middle of the restaurant - surrounded by tables. It was very busy that day, and the garbage bag was full. One of my responsibilities was to take the garbage out when it was full. I don't know what I was thinking - obviously I wasn't thinking too hard. The thought of planning the maneuver I had to execute with this full garbage bag never occurred to me. As I lifted the bag out of it's place in the cart, it burst open in full view of all the diners of the tables nearby. The result wasn't appetizing or appealing for them and was definitely embarrassing for me. I had to get a new bag and clean everything up. Unfortunately, it took me a lot longer to learn some good lessons about planning even after I had that experience. My brother and I had talked about becoming school teachers after high school - he would be a Physical Education teacher, and I'd teach Music/Band. We would ski together during the Christmas break, and then on Summer breaks we would tour the world together. We thought we had a good 'plan'. Our plan soon fell by the wayside as it was more like 'wishful thinking' than a plan that we could execute. For whatever reason, I wasn't very motivated to go to university right out of high school. Frankly, I was a bit burned out on school for the time being. 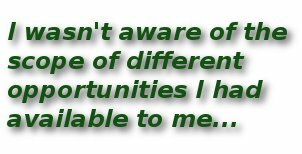 Also, I wasn't aware of the scope of different opportunities besides university that I had available to me. As a result, I didn't have much of a plan for my life then. My decisions lacked foresight as I was looking ahead a year at the most. If I had thought about it, I actually had a number of good examples of how to put a plan together, even at that time of my life. Every song we played in band in high school had a 'plan of execution' - the musical score. It's a written plan of how a song is to be played, it's notes, dynamics, how fast or slow, when not to play, etc. Another plan that I was exposed to at school were plays we used in basketball. Our coach would write both offensive and defensive plays down on a board. We'd have to commit them to memory and practice them so we knew who was going to be where at a given time during the play. This would help us be more organized and confident when we were playing a game. Everyone knew their place/position and their responsibility. a. I still wouldn't think about doing a degree right out of school. I was burned out on education that wasn't practical. b. I might take an intense, fast-track program at a nearby community college that would give me practical experience at a skilled job and get me out into the work force in 18 months or less. Or, if I couldn't find the right course, I'd work for a year and then skip to point 'd'. c. I would get a job that utilizes my training and work it for 2-3 years, all the while asking questions and keeping my eyes open for interesting opportunities for the future. d. Once I had saved a bit of money, I would go traveling. I'd try travel for at least 2 years - working while I traveled. I'd make a concerted effort to get fluent in a foreign language and live like the locals do, learning about their cultures. - learning about the teachers - have they had industry experience? Think about planning your life before you finish grade 12. Confucius said, "He who does not reflect, and does not lay his plans far in advance, will find difficulties at his door" I can attest to the truth of this statement. Learn from my mistakes. Links to the rest of my job journey are below.